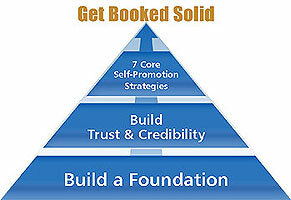 The Book Yourself Solid System revolutionized our business and it can do the same for yours. That is why we became a Certified Book Yourself Solid Coach. We believe in it that strongly. Are you ready to attract the people you are meant to serve—those clients that energize, inspire and allow you to do your best work? With me at your side, as guide and coach, we go step-by-step through what to do and how to do it. Every step is clearly laid out in the Book Yourself Solid 15 point sequential System. You get a complete step-by-step system. Everything is covered from beginning to end. You won’t be left guessing what to do or how to do it. Everything is laid out in 15 easy steps. You just follow the steps. The Book Yourself Solid System has taken every obstacle people have in understanding their target market, finding their ideal clients, creating your sales cycles, info products and eliminated them one by one. From finding your target market to creating a product, to getting BOOKED SOLID, even if you aren’t an expert at ANYTHING but what you do, it’s all covered. Saves you tons of time. No need to figure out how to do it all yourself. Sure, you can buy the book. It’s available at Amazon. But imagine how accelerated your growth and implementation will be with a Certified Book Yourself Solid Coach at your side. I’ve trained personally with Michael Port, the founder and CEO of the Book Yourself Solid system. If you could even get him to personally coach you, it would be Thousands of $$$ for each session. Yet, he wanted to bring this amazing system to service professionals and businesses that can’t get access to him (hey, he’s just one guy and there is still only 24 hours in a day.) Michael has chosen to certify only 25 Book Yourself Solid Coaches internationally. There’s something for you if you’re a beginner or have been in business awhile. You get instantly usable worksheets and action plans, templates, handouts and checklists. Besides all of the valuable Book Yourself Solid System’s success materials, I dig into my own secret “in-house” training materials and pull out the stops for you, so you don’t have to create from scratch unless you want to. Since, I am his certified Book Yourself Solid Coach, I have access to him, to all his training materials, to the entire Book Yourself Solid Team, all that, plus my MBA background with my years of business coaching for Impression Engineers. I coach you through the action points and strategy plans. Then we just follow the plan. You don’t have to try to figure out what’s next. You just follow the steps. Think about the person you are when you are performing optimally at your peak – when you’re working with people who are both friends and clients. It’s incredibly easy once you identify who you want to work with…and with absolute certainty determine that you will settle for nothing less. Rest assured that once you define your ideal clients, you get to enjoy the unadulterated pleasure of dumping your duds to make room to Book Yourself Solid with inspiring clients. Your clients are an expression of you. Many entrepreneurs and salespeople will work with anyone who has a heartbeat and a dollar bill, often leaving them with too many challenging clients. Learn how to tighten your red velvet rope for YOUR ideal clients only. By eliminating the painful negative energy and time spent worrying about challenging client relationships, you will dramatically increase your productivity, happiness and client referral rate. That idea of releasing clients may seem scary right now, but stay with me. Embrace the concept and trust that as we move through the 3 Building Blocks of the Book Yourself Solid System — any fears and concerns will be answered. Three modules teach you all of the smarter marketing and lead generation techniques you need to transform your business and meet your goals. We’ll begin by building a foundation for your business that is unshakable. If you are truly serious about becoming a super successful service professional, you must have a steadfast foundation on which to stand. This is where you create and implement your trust and credibility strategy. You’ll be considered a credible expert in your field and you’ll start to earn the trust of the people you’d like to serve. The magic starts when you begin Module III, where you’ll learn the 7 core self promotion strategies that will build awareness for the services you offer by using smarter marketing strategies that spotlight your talents, and feel authentic and honest. So, Are you Ready to Book Yourself Solid? If you’re ready, I’m ready to help you attract the people you are meant to serve—those clients that energize, inspire and allow you to do your best work. Based on the fundamental idea that there are certain people we are meant to serve and others we are not. The 16-week Book Yourself Solid System is a great way to gain momentum, direction and clarity for your business. The Book Yourself Solid System is organized in 3 modules. Individualizing your marketing strategies to take advantage of your strengths and help your business grow. A la carte coaching sessions: You may also schedule individual sessions on a monthly, quarterly or as needed basis. — Use the link below to process your payment for the session online via credit or debit card. Once your request is processed, we will be in touch with you, via email, to schedule a day and time that works well for both of us. — Consider the agenda you’d like to set for our initial coaching session. I’ll attach a coaching call agenda so that you can identify what you’d like to discuss during our call. Please return the agenda at least 48 hours before our session. "…Sharon helped me with a short presentation I had to give. Her keen observation coupled with her understanding of non-verbal communication translates into a powerful coaching style that is both direct yet gentle. I would highly recommend her services to anyone committed to excellence. Her area of expertise is very unique and critical to anyone who presents or does public speaking." "Sharon increases your intelligence. Her coaching strategies document possible resistance—she is able to stay within the persons belief systems and nudge them to expand their self image and charisma. As a person increases their range of behaviors, their effectiveness increases and a whole new range of possibilities open." You can begin to see results long before the end of the 16 weeks. The Book Yourself Solid System is the fastest, easiest and most reliable system for getting more clients than you can handle even if you hate marketing and selling. Sharon, I want to be Booked Solid too. Let’s get started on my success today. What’s my next step? Grab your FREE Book Yourself Solid quick-start pack. This quick pack shows you why the Book Yourself Solid system inspires even the most reluctant marketers. A free subscription to the Best Impressions content-rich weekly e-newsletter to keep you up to date on all current market trends and help you get booked solid fast! Please share your mailing address with us too so we can send you a free gift by mail just for signing up.